You’ll probably want to spend a few afternoons browsing some interesting and unique Vietnam markets across the country. Each region of the country – north, central, and south – has its own distinct heritage, traditions, and handcrafted goods. This makes Vietnam shopping a favorite activity of just about all travelers. Here’s everything you need to know about Vietnam shopping: the currency, local customs, the best Vietnam markets, and more. So when you get there, you can devote all your attention on what to buy in Vietnam. Vietnam’s currency is known as the Dong and its symbol is ₫. At the time of writing this, one Vietnamese Dong equals 0.000044 U.S. dollar. This means that 1$ equals about 22805 ₫. The Dong’s value fluctuates just like the U.S. Dollar and Vietnam’s economy has remained fairly strong over at least the past few years. In 2009, Vietnam began a period of rapid economic growth which caused the currency value to increase fairly quickly. Believe it or not, many Vietnamese markets, restaurants, and shopping centers also accept U.S. Dollars. However, you shouldn’t expect to pay the same exchange rate. An item might cost the equivalent of $2 if you pay in Dong but $10 if you pay in USD. It’s totally up to the vendor what they want to charge in each currency. It’s worth mentioning that although shops may accept foreign currency, it is illegal for vendors to list or ask for payment in anything other than the Vietnamese Dong. For these reasons, it’s highly recommended to exchange your Dollars, Euros, or any other currency for Vietnamese Dong when you get there. Fortunately, this is very easy to do when you get to the country and even throughout your trip if necessary. Simply exchange your home currency for Dong at the airport when you get there. If you’re traveling with a lot of cash, this can become a problem because you’ll have huge wads of bills after exchanging. Remember that foreigners are always ideal targets for pickpocketing – anywhere you travel – because thieves know they usually have a lot of cash on them. Plan your currency exchanges to line-up with your travels to major cities like Hanoi or Hồ Chí Minh where you can find banks willing to help. In rural areas, you’ll probably be out of luck. Vendors in high-traffic tourist destinations might be willing to exchange your currency – but at highly inflated rates. Vietnam is not like the United States in regards to bill quality. If your home currency is crumbled or damaged in any way, exchange centers may not accept it or charge an inflated rate. Likewise, vendors may not accept torn or crumbled Dong. You’ll need to present your passport when exchanging currency. Gold shops and pawn shops may be willing to exchange your currency without a passport but this practice is technically illegal – don’t get yourself into trouble. ATMs are widely available in cities and dispense money in Dong. Check with your bank about transaction fees. The Dong is printed in denominations of 500; 1,000; 2,000; 5,000; 10,000; 20,000; 50,000; 100,000; 200,000; and 500,000. Lower value bills are made of paper while 10,000 and up are printed on plastic. The Dong’s 20,000 and 500,000 denominations look very similar in color. Make sure to pay close attention or keep the larger denominations separate. How Much Money Should You Take on Your Vietnam Shopping Adventure? As you’re planning what to buy in Vietnam, it’s important to also plan your budget. And not only do you need to set a budget, but you also need to carefully plan how much money to carry. As mentioned above, you probably don’t want to exchange all of your home currency immediately. Instead, plan a few exchanges and carry some small amounts for things to buy in Vietnam throughout your trip. How much money you carry for things to buy in Vietnam depends on your shopping style. An average person shopping for clothes and trinkets should probably set aside $100 to $250 for their entire trip’s shopping budget or roughly ₫2,200,000 to ₫5,500,000 (not an exact exchange rate). Many travelers love extravagant Vietnam shopping trips due to the broad range of unique lacquerware, jewelry, artwork and paintings, and high-quality artisan handcrafted goods. If that sounds like you, plan a larger budget of about $500 to $1,000+ or ₫11,000,000 to ₫23,000,000 for things to buy in Vietnam. When you’re planning your budget and what to buy in Vietnam, make sure to leave some wiggle room – bargaining is a big part of the Vietnam shopping process. Some westerners may not feel comfortable debating with a vendor for a fair price while others may aggressively push to reduce the price as much as possible. Try to find a nice middle ground between these two attitudes. You’ll probably be a natural by the end of your Vietnam shopping trip. Here are some tips for bargaining prices on things to buy in Vietnam. Offer half of the asking price first and work your way up from there. Vendors at Vietnam markets usually offer a very inflated rate to foreigners at first so get comfortable bargaining. If something has a price tag, the amount isn’t negotiable. This includes taxis and food. The goal is for everyone to walk away happy – not to get the lowest price possible. The difference in USD is often negligible anyways so be respectful. If you’re really not happy with the final price offered, walk away. The vendor will likely provide their best price possible after that. Deciding what to buy in Vietnam depends entirely on your tastes. Some folks love Vietnam shopping for the clothing while others love the trinkets. 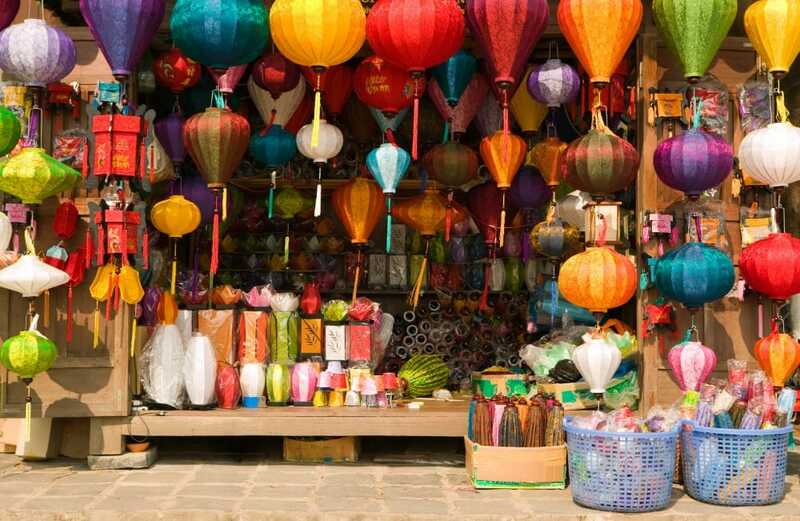 Here is a taste of what to buy in Vietnam so you can get an idea of what to spend on your Vietnam shopping trips. Keep in mind that the prices of these things to buy in Vietnam are very general. Prices vary depending on the location, season, quality, and vendor. Silk Clothing, Embroidery, and Fabric: One thing foreigners love about Vietnam markets is a wide variety of vibrant silk fabrics everywhere. Look for scarves, pants, shirts, and dresses. Price range: $3 (₫70,000) to $10 (₫200,000) and up. Paintings and Artwork: Vietnam has no shortage of amazing artists selling lacquer or sand paintings. Price range: $10 (₫200,000) and up to over $1,000 (₫22,000,000). War Relics: History lovers will love browsing the combat boots, uniforms, helmets, Zippos, and other war surplus gear. Price range: $5 (₫110,000) to $10 (₫200,000) and up. Lacquerware and Ceramics: Between dishes, vases, and tea sets, you’ll have trouble closing your suitcase with all these ceramic or lacquer things to buy in Vietnam. Price range: $3 (₫70,000) to $10 (₫200,000) and up. Conical Hats: These traditional hats date back 3,000 years so you’ll probably want to snag one on your Vietnam shopping adventure. Price range: $1 (₫22,000) and up. Unique Paper Products: Post cards, pop-up pictures, and bamboo notebooks. These interesting things to buy in Vietnam are definitely worth the small amount of money. Price range: Less than $1 (₫22,000) to $10 (₫200,000) and up. Wooden Clogs: You don’t see Vietnamese people wearing these too often outside of ceremonies, but they make a pretty cool souvenir. Price range: $3 (₫70,000) to $10 (₫200,000) and up. Jewelry: Definitely save some money on your Vietnam shopping trips for the broad range of silver and gemstone jewelry. Price range: varies depending on the metal and gemstones. Gold is market price. Musical Instruments: When you’re planning what to buy in Vietnam, you may not think about musical instruments, but they make a one-of-a-kind gift. Price range: $10 (₫200,000) and up. Vietnam markets are the perfect place to fully embrace the beautifully blended traditional and modern local culture. These shopping destinations contain traditional goods like silks, jewelry, and handcrafts as well as cutting-edge fashion and styles. For many years, France carried out a harsh military occupation over Vietnam. Although revolutionary forces liberated the country in 1945, French influences remain throughout several boutique-style Vietnam markets and shopping centers. This bustling market in Hoi An along central Vietnam’s east coast is a must-see for all new visitors. Nothing beats the fresh fish, flowers, and spices here. You can also find plenty of silks, handcrafts, and souvenirs. What really makes Central Market stand out? The tailors that can alter your clothing within just one day. An Dong market in Hồ Chí Minh is one of many multi-story indoor Vietnam markets and it’s open every day from 8:00 until 2:00. If you love fashion and jewelry, this is the place to go for things to buy in Vietnam. Each floor is dedicated to different goods and the top floor is reserved for local vendors. Phu Quoc is an island off the southwestern Vietnamese coast near Cambodia and it’s definitely worth at least a daytrip. Although there isn’t a ton of shopping, the few Vietnam markets make it up in quality. The Green Boutique sells homemade massage oils, essential oils, haircare, skincare products, and plenty of things to buy in Vietnam made with local ingredients. Anyone who knows anything about Vietnam shopping knows that the Weekend Night Market in Hanoi is like a rite of passage. The decorative lights, silks, sunglasses, shirts, and handicrafts make this shopping destination an excellent photography setting. If you’re a history buff, you’ll definitely want to add Dan Sinh Market to your Vietnam shopping list. Between the uniforms, combat boots, identification tags, helmets, and other interesting war surplus gear, you’ll wonder how to fit it all in your suitcase. Some items are authentic while others are replicas. Hue is a small city along eastern Vietnam’s eastern coast and as the oldest market in the city, Dong Ba is a must-visit. This market opens really early at 3:00 AM so you have plenty of time to shop the fruits, vegetables, and handicrafts. Dong Xuan is a giant indoor market in Hanoi with unique Soviet-style architecture. Like most of the multi-story Vietnam markets, you can find just about anything you’re looking for. Nha Trang outdoor market opened in the 1970s and has been a thriving shopping destination ever since. Although most people stay fixated on what to buy in Vietnam, you should definitely bring your camera with you to every market to snap some amazing shots. Hang Bac Street is well known as a jewelry destination. In fact, it’s in the name: “Bac” translates to “silver” in Vietnamese. Not only can you score some great necklaces and bracelets, but this district also has amazing character for creating a unique experience too. Applying for your Vietnam visa doesn’t have to be a time consuming and dreadful process – we make it easy and fast. If you’re planning things to buy in Vietnam, apply for your visa now: early rates mean you can spend less money on your visa and more money at Vietnam markets. Anyone traveling to or through Vietnam needs a visa from the Immigration Department. With Vietnam Visa, you can apply online now and pick your visa up at the airport when you arrive. You’ll receive your approval letter via email within just two business days. So what are you waiting for? Apply for your visa now and start planning which Vietnam markets to visit.